It’s rare to see a paper card catalog in libraries. Most libraries have digitalized them on their internal computers or made them available online. Media outlets and websites have archives of articles people can look at for research. While all this information is useful, it puts someone at a loss if they don’t know how to use it. Just because it’s on the Internet doesn’t necessarily mean it’s free to take. In order to research your material the most effective way, try following the helpful tips below. Find credible sources. There are several items you should look for to see if a website is credible. First, look for an author’s name. Is there a byline to the article? There should also be a date, either when the website is copyrighted or when the article was published. Likewise, does the article have a link to sources? If no, this article is not a credible source. Ask yourself how accurate the information is within the article. Search for any type of error such as spelling, punctuation or grammar or something else. Finally, type a sentence into Google. If the article is the only one to come up, this means it has not be reproduced anywhere else. Yet, if several identical articles arise in the search results, the article may not be unique content. Use quotation marks. If you’re searching an exact phrase, place it in quotation marks within the search box. For example, let’s say you’re searching for golden retrievers. In the search bar, type “golden retrievers.” This technique will return search results that contain that exact phrase. It’s going to omit any search results that only contain “golden” or “retrievers” by themselves. This is a more effective way to get the results you want while not having to search for a long period of time. This technique, also, requires you have the exact phrase correct or you may be searching for a while. Use plus (+) and tilde (~). Most may know that adding plus tells Google to search that additional term. For example, you may enter Knitting+crochet supplies. This tells Google–or whatever search engine you’re using–that you want knitting supplies and crochet supplies. If you were to enter this, however: “knitting+crochet supplies”, then Google would return more exact results to you. On a different note, the tilde sign (~) tells your search engine that you want to search for synonyms. You may search for ~pants, for example, and the search example may retrieve bell bottoms or jeans for you. This tool is useful if you’re writing and simply stuck on a word. Or, it may be useful when you have to research a topic more thoroughly and need more information about its history. However you choose to use it, it’s a nice hidden trick of Google to keep in your back pocket. Follow RSS feeds. RSS (Really Simple Syndication) is often a great source of material. Follow your favorite blogs, magazines, and newspapers through an app or RSS website. It’s best to find one that helps you categorize your feeds, otherwise, you will get overwhelmed and rarely read them. Also, try to save or archive the articles that you might use later on. I use a news app called Flipboard on my phone and I also use Feedly. While they’re both RSS readers, Feedly gives me the opportunity to follow news outlets while Flipboard lets you flip news into magazines. Find an RSS service that fits your needs and that’ll really benefit your research. Always paraphrase/use citations. If you use someone else’s work, always put it into your own words. When you don’t, this is clearly plagiarism. If you can’t put it in your own words, it should look like this within your text: “He said this,” according to the source. Then, in your footnotes on your citations page, give the author credit for their information. How you cite your information depends on what you’re writing. APA (American Psychological Association) citation style applies to any writing within the social science fields or education. MLA (Modern Language Association) is generally used for literature, the arts, and the humanities. Chicago Style is often reserved for those topics relevant to history. It may also be used for anyone that writes for scholarly or non-scholarly journals. Similar to Chicago Style is the Turabian Style. This style was designed for college students to use for any form of writing. And lastly is the AMA (American Medical Association) citation style that is used in writing referring to medicine, health or biological science. 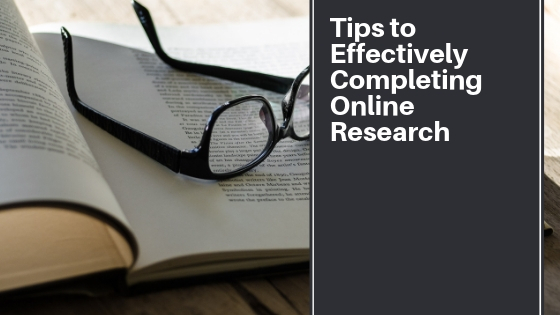 I hope these online research tips have helped you get a jumpstart on your writing. Have more tips? Leave them in the comments below!